G.P. Putnam's Sons, 9780399158582, 288pp. From C. J. Box, the "New York Times"-bestselling author of the Joe Pickett novels, comes a thrilling book of suspense stories about the Wyoming he knows so well--and the dark deeds and impulses that can be found there. Over the course of eighteen books, C. J. Box has been consistently hailed for his brilliant storytelling and extraordinary skills at creating character, suspense, and a deep sense of place. All of those strengths are in the ten riveting stories--three of them never before published--that make up "Shots Fired." In "One-Car Bridge," one of four Joe Pickett stories, Pickett goes up against a "just plain mean" landowner, with disastrous results, and in "Shots Fired," his investigation into the radio call referred to in the title nearly ends up being the last thing he ever does. In "Pirates of Yellowstone," two Eastern European tough guys find out what it means to be strangers in a strange land, and in "Le Sauvage Noble," the stranger is a Lakota in Paris who enjoys playing the "noble savage" for the French women--until he meets Sophie. Then he discovers what "savage" really means. "Shots Fired" is proof once again why "Box is a force to be reckoned with" ("The Providence Journal-Bulletin"). C. J. 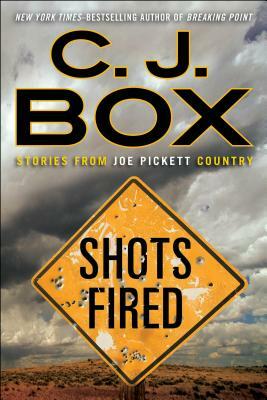 Box is the author of fourteen Joe Pickett novels, most recently "Stone Cold," and four stand-alones, most recently "The Highway." He has won the Edgar, Anthony, Macavity, Gumshoe, and Barry Awards, as well as the French Prix Calibre .38. He lives outside Cheyenne, Wyoming, with his family.